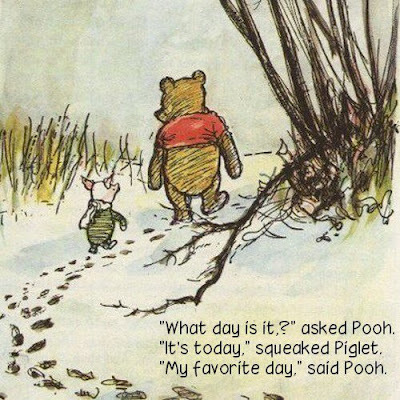 There’s something about Pooh. Something very pleasant about him. He’s a honey obsessed bear. He means well, and always equipped with good intentions but the more he tries ‘his best’, his best turns out to be the worst disaster! But in the end, a solution arises, and all things work together for good. Despite all their so called ‘disorders'(You can easily look up the Winnie the Pooh character analysis from a psychological point of view), they all find a place to fit in. They make it work somehow. Like a puzzle they fit together to make a complete piece of timeless art: Winnie the Pooh! Through the adventures and misfortunes, a tight bond is formed between the characters. An experience lived together deepens the relationships. It’s not always a happy world. They have their own version of dramas. Through the obstacles and hardships, mistakes and errors, moral values are being tried, and proven to be true and love and compassion always, always wins. Lately my nephew has been obsessed with Winnie the Pooh. Not as bad as my Pride and Prejudice obsession, or Pooh’s addiction of honey, but it’s pretty up there. After we watched yet another round of Winnie the Pooh, lying in bed, I had some deep contemplation about the why. Why does my nephew like Winnie the Pooh so much lately? Why is it winning over all other favorites of his? Pokemon, Speed Racer, Power Ranger, etc. Then I remembered the beginning of his love affair with Winnie the Pooh. It was a little over a month ago. My sister’s birthday. As a birthday gift, I offered to watch the kids by myself so that she can go out with her husband for a nice romantic dinner. That night at home, we watched Winnie the Pooh together. I had placed them in the cozy sofa, put a soft blanket over them. Then while their eyes were fixated on the cartoon, I was reading in the corner. It was a very peaceful evening. A memory quite unforgettable. While the parents were out deepening their love, having a night out for the first time in years, the kids were perfectly content and happy by the comforting power of Winnie the Pooh. Later that night, my sister and my brother-in-law came back all smiling and happily in love with each other more than ever. I remember the joy firing off from the three happy children upon seeing the return of their parents. It was an evening with a happy ending where everything was just perfect. Perhaps, the real deal is that my nephew is craving that whole experience of that evening whenever he watched Winnie the Pooh. Perhaps, I am over-analysing things.